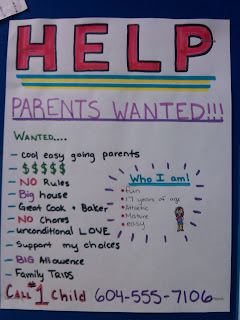 I was walking through the hallway of a local high school when I saw a bulletin board full of postings for parents. This was obviously part of a class activity. It interested me to see what the young people would put in a want ad for new parents. Some obviously came out of some desire to get attention or to be funny, but as I looked them all over I found some repeated themes. Here is how I categorized them. I counted out the responses and put them in a chart.